Read 32 customer reviews about Original Hatchbag Roof Racks & Cargo Carriers that have an average rating of 4.5 to find out what product is best for your vehicle. We recently traveled through six states for our vacation. The exra storage the Sherpa bag provided was a blessing. We had extra luggage and baby items for our grandchildren, who would be arriving by plane at our destination. In addition, we also traveled with our golden retreiver. 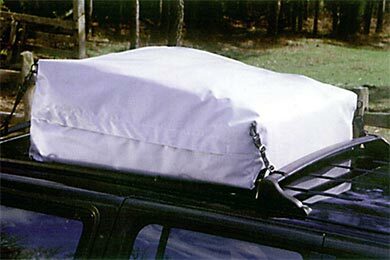 The bag remained very secure on the roof rack once the tie downs were tightened. We also drove through rain periodically and everything remained dry. The extra tight velcro flap over the zipper closure kept everything secure and dry. Our vehicle is a Mercury Mountaineer. The bag fit wll into the space between the cross over bars on the rack. It did not interfere with the sun roof at all. Storage of the bag is convenient. You just fold it and tuck it away. Lancaster,Pa. Reference # 756-903-792 © 2000-2019 AutoAnything, Inc.